A single tri-state buffer with active low enable and a 4-bit wide tri-state buffer with single active low enable are written in VHDL code and implemented on a CPLD. Both tri-state buffers are implemented in the same VHDL code of a single project. This video shows the two tri-state buffers in operation on the home made Xilinx CPLD board. A single tri-state buffer with active low enable pin is shown below. A group of four tri-state buffers with a single enable pin is also shown. Both of these buffers are written in VHDL and implemented on a CPLD. The VHDL code for the single and quad tri-state buffers is shown below. When the EN pin is low, then the logic level on the A input will appear on the Y output. If a logic 1 is on the EN pin, the output Y will be tri-stated (made high impedance indicated by Z in VHDL). 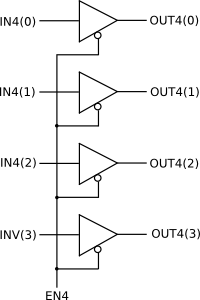 When the enable pin EN4 is low, then each of the logic states on the inputs of the buffers will appear on their corresponding outputs. If the EN pin has a logic high applied to it, then all buffers will be tri-stated ("ZZZZ" is used to tri-state all four buffers in the VHDL code).